Oleg Tselkov was born in 1934 in the vicinity of Moscow. His father, a passionate art lover, would often go out of his way to help his son in becoming an artist. From 1949, Tselkov attended Moscow Middle Art School, successfully graduating in 1953. After his expulsion in 1954 from the Minsk Institute of Art and Theater (for ideological reasons) and the Repin Institute of Art , Sculpture and Architecture in 1955, Tselkov joined the Leningrad Theater Institute, where his mentor was N. Akimov. In 1958, he graduated with a diploma of stage artistry and technology. Then moving to Moscow, he became engrossed in painting rather than working in theatre. His first personal exhibit took place in 1965 at the Kurchatov Institute of Nuclear Physics in Moscow. Although Tselkov’s oeuvres were not demonstrated at official exhibits in the USSR, foreign buyers and his immigrant friends smuggled his works and often exhibited them abroad. Since 1960, starting with The Portrait, Tselkov has been developing a single theme in his art, namely the images of deformed human faces and bodies, reminiscent of sinister masks or anthropomorphic mutants. His portraits are an original response to the new formal methods of the Severe Style. 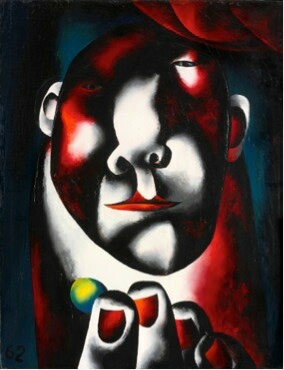 The distinctive features of his painting are “stereotypity”, large scales and bright aniline colors. His art was influenced by modern primitivism and the late works of Malevich. In 1977 Tselkov and his wife left the USSR and established themselves in Paris, where they have been living and working ever since. From 1980-1990 Tselkov enhanced the hues of his painting, enveloping the figures in a nebulous haze, and often expanding the canvases to the size of wall panels. In 2004, a solo exhibition was held for Tselkov at the Russian Museum and the State Tretyakov Gallery. Jean-Jacques Geron collection (Paris, France).